We've had homecomings - two of them. 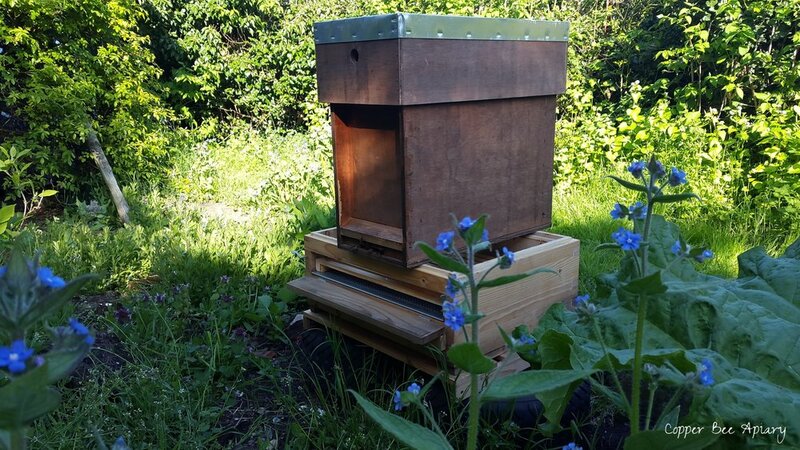 The first was on Friday, when I split the colony of Queen Nefertiti at the orchard, and brought her and 5 frames home in a nucleus box. I left behind the remaining 6 frames, including open brood, eggs, and queen cups, and am hoping that the remaining bees will raise a new queen. 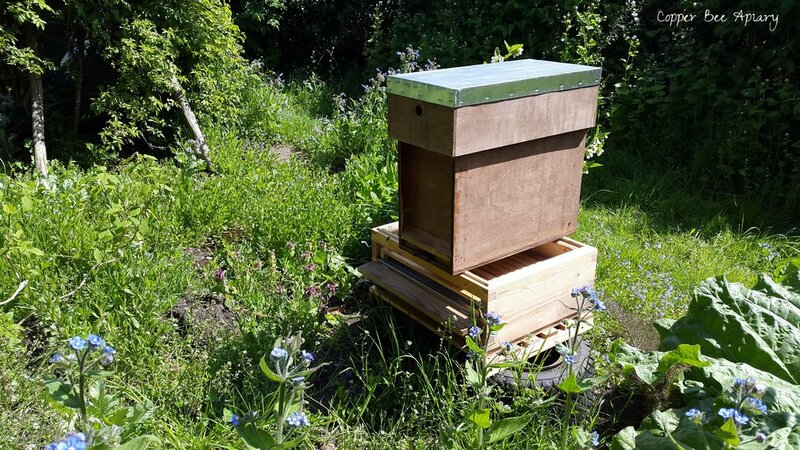 Meanwhile Queen Nefertiti's nucleus box is now home in the garden, seeming so right that it feels as if the bees have always been here. 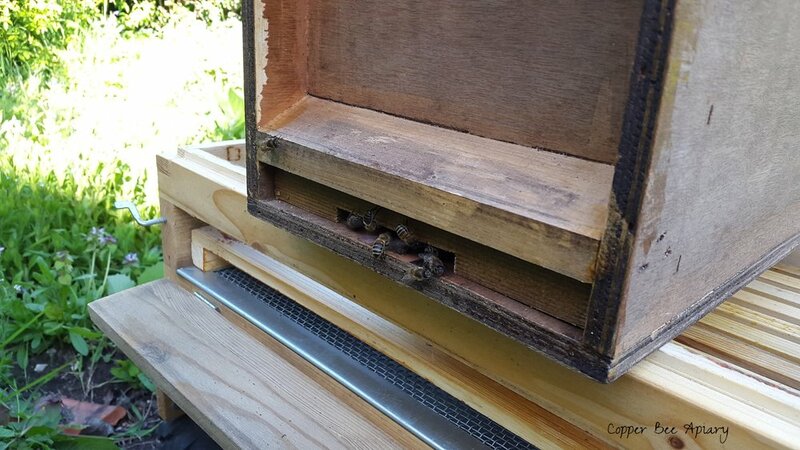 When the bees have settled after their journey, I will transfer the frames from the nucleus box to a hive (the nucleus box is currently standing on the floor of the hive I will put them in). The second homecoming was yesterday, Bank Holiday Monday. At noon, a swarm of bees arrived at the bait hive. I happened to be passing by the hive just before noon, and noticed a lot of active scouts around. I thought I'd get my camera, just in case the swarm arrived that afternoon. 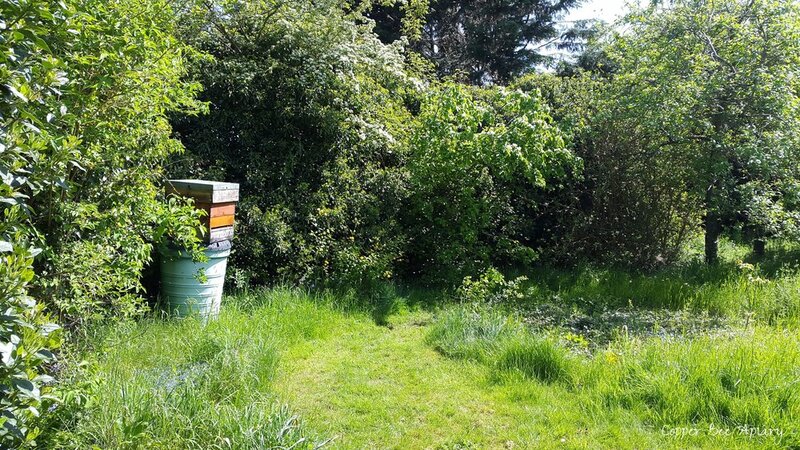 When I returned with the camera, the air in the clearing in front of the hive was buzzing: the swarm had come! I stood and watched as the cloud of bees gradually condensed around the front of the hive and began pouring in to it. It only took 5 minutes for the whole swarm to go in to the hive. I videoed it all, to show you. Or I thought I did. When I played back the 5 minute video, it turned out I had only managed to record the first split second. Which is a great pity, because it really was spectacular. I'm thrilled that I was there to see it. 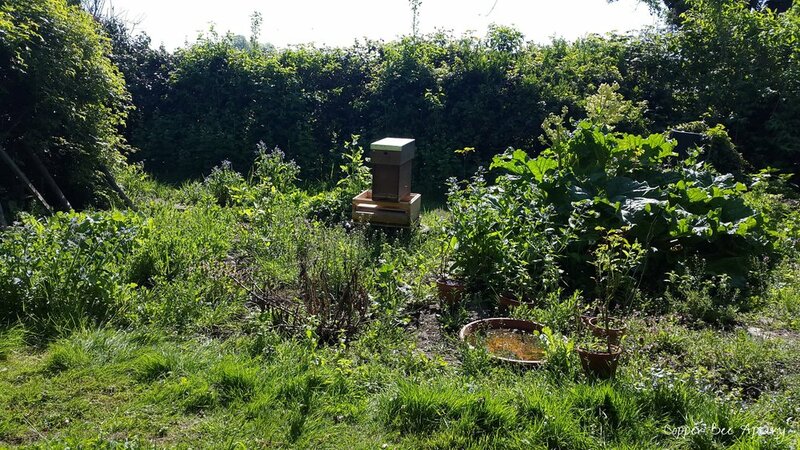 Isn't it impressive that the bees came here and moved in of their own accord?! It did occur to me that it might be Queen Nefertiti's colony spontaneously moving to more spacious living quarters. But they were still coming and going as normal from their nucleus box, looking just as they did before. I will leave the new colony for several weeks to settle in. 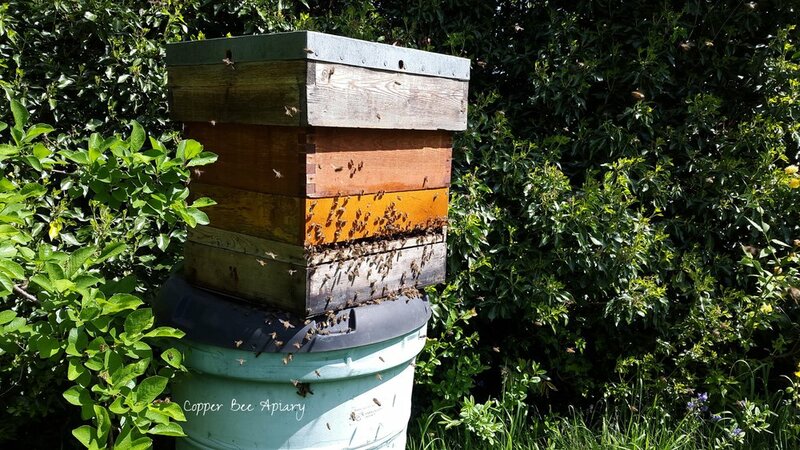 I don't know yet whether they are a primary swarm with a mated queen from a previously established colony, who will begin rearing brood immediately, or a cast swarm with a virgin queen who will first have to mate. In case it's the latter, I will leave well alone so as not to jeopardise mating flights. The good news is it's ideal mating weather and Queen Nefertiti's colony should be able to offer some highly eligible drones. *From Requiem by Robert Louis Stevenson, 1850-1894, and Rusty Burlew of Honey Bee Suite.